From the new Starter Incentives Manager, you’ll select people you want to target with special incentives and set your preferences. Save your choices and it immediately goes into affect! Not online enough to be available regularly for live chats? No worries, because you can also choose an email version (Starter Incentive #101), an incentive to engage with you via email instead. And this is just the beginning! 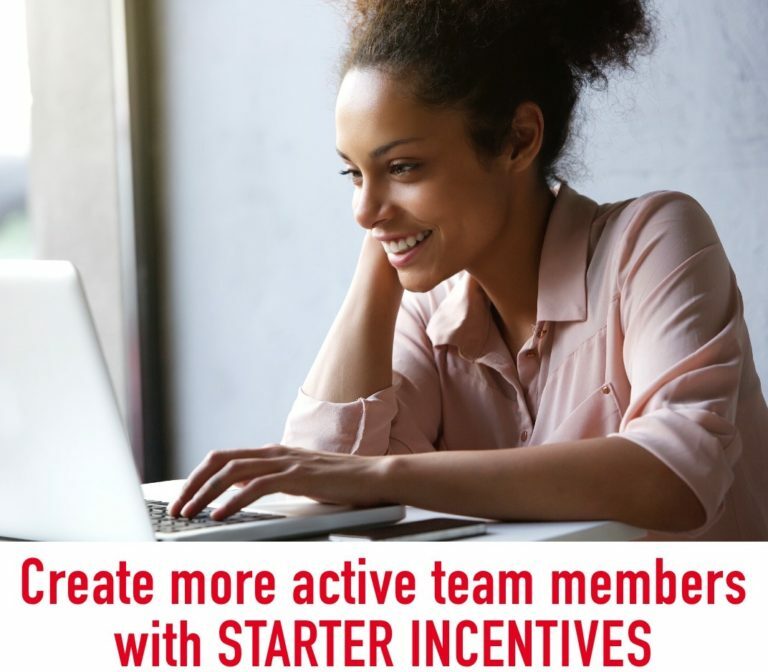 There are almost infinite ways that Starter Incentives can be used and we plan to work with SFI leaders to develop a variety of options in the months ahead. In the meantime, you can put to work for you one or both of our first two Starter Incentives IMMEDIATELY. Q: Who pays for the cost of the incentive offered? Q: Is there a limit to how many Rewardicals I can offer? There’s a current minimum limit of five (your cost $.01) and a maximum limit of 5,000 (your cost $10) per incentive. Q: When exactly does the new PSA see the incentives #100 and #101? It is currently set to appear two minutes after submitting their registration. However, we may test other times to determine which time produces the best results. Q: Can I turn off a Starter Incentive I’ve created if needed? Yes, you have full control through the Starter Incentive Manager. Turn on or off as you wish. Q: When I turn on a Starter Incentive, how soon will it take affect? Immediately. For example, if you turned on Starter Incentive #101, the very next PSA you signed up would be offered the incentive. Q: Can I adjust the amount of Rewardicals offered as needed? Yes. Just go to the Starter Incentive Manager, change the amount, and save. Your new amount will kick in the very next time your incentive is offered. Q: What if I run out of funds in my Starter Incentives account or don’t have enough in it to fund my chosen Starter Incentive(s)? Your chosen Starter Incentive(s) would automatically cease until additional funding was added. Q: Will there be other incentives besides Rewardicals that can be chosen? 1. They give the recipient lots of great choices; Rewardicals can be redeemed for cash, VersaPoints, CSAs, PSAs, TCredits, gift certificates, Bitcoin, and more. 2. It allows you, as the sponsor, to offer generous amounts very inexpensively. Indeed, you can literally offer a nice reward of five Rewardicals at a cost to you of just once cent! And larger incentives like 100, 250, or 500 are also very inexpensive. 500, for example, is only $1.00. Q: Should we really be incentivizing people with rewards for doing what they should already be willing to do without a reward? Perhaps not. On the other hand, if offering a small reward is what caused some of your recruits to take action that otherwise may not have…it’s money very well-spent. The only way to know for certain is to test it…which the Starter Incentives program allows you to do easily and inexpensively. Q: Will there be tracking provided, to help me determine which Starter Incentives are working for me? Q: Can you advise which incentives work best? Yes! The new Starter Incentive program is very much a giant, companywide split testing program. We will be tracking every type of incentive used, the amounts of Rewardicals offered, etc. All of this data can then be analyzed to determine the “winning formula.” As soon as we feel we have enough data to form conclusions (best amount of Rewardicals to use, etc. ), we’ll be sharing these conclusions with everyone, so every affiliate can put the proven formulas to work for them! Q: What other types of Starter Incentives might we see? Select inactive persons in your Genealogy to receive a professionally-designed, “We’ve missed you!” email autoresponder series that offers Rewardicals for logging back in and earning some VersaPoints. Could also be automatic, triggered by X days without logging in. Offer new PSAs a small amount of Rewardicals every day for their first 30 days for each Biz Quiz they get right. 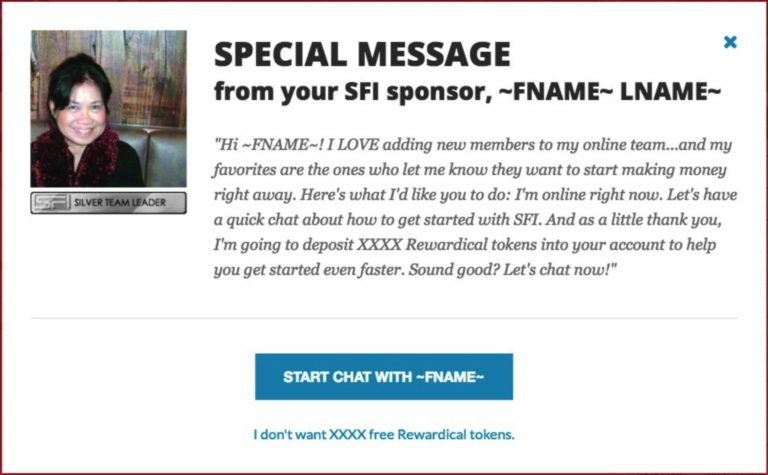 This would incentivize daily logins and activity while at the same time generating valuable exploration/education about SFI and its properties. Reward team members for logging in for, say, 100 straight days (or for whatever number of days you wanted) or for creating a VersaPoints streak. Rewardicals could be offered to new affiliates for trying out Astro Auctions, for verifying their email address, entering their monthly goals, and so on. Rewardicals could also be offered to your PRMs for playing Eager Zebra games, or making a purchase…or even offered to prospects for taking any action you wanted (e.g. subscribing to your blog’s mailing list). There’s almost no limit to how Starter Incentives could be used. And all or most can be easy “set-it-and-forget-it” (i.e. automatic)! You’d just choose the option at the Starter Incentive Manager and it would be all set! Q: Am I limited to choosing just one Starter Incentive, or can I utilize multiple ones for different objectives? You can opt in to as many as you want. Q: I have lots of Rewardicals. Can I use them with Starter Incentives? Not directly. You can, however, redeem your Rewardicals for a TripleClicks gift certificate, and then purchase funding for your Starter Incentives account with the gift certificate. Did you get your free TCredits this month?